No credit card needed. Takes 15 seconds or less. Syncfusion has been in business for over 15 years. Our products power the best-known software on the market. From trading systems for the largest financial institutions, to drilling systems for the largest energy companies on the planet, Syncfusion products have been used in virtually every business environment. With Syncfusion, you are in good hands. We chose Essential Studio for Xamarin based on the breadth and quality of the components and the excellent support." The toolkit contains all the components that are typically required for building line-of-business mobile applications. We are always enhancing existing components with new functionality and adding new components with every major release. We also publish monthly service packs which include bug fixes. We believe that good performance is critical for delivering a good user experience, so we ensure that all our components have been designed and built to get the best possible performance. We have completely reimagined all components for touch input. The included complete MVVM support enables you to create robust scalable and testable applications. Complete integration with Visual Studio includes NuGet support, and IntelliSense comments. We include all the self-help resources required to easily integrate our components with your applications, including documentation, knowledge base articles, tutorial samples, and real world samples. 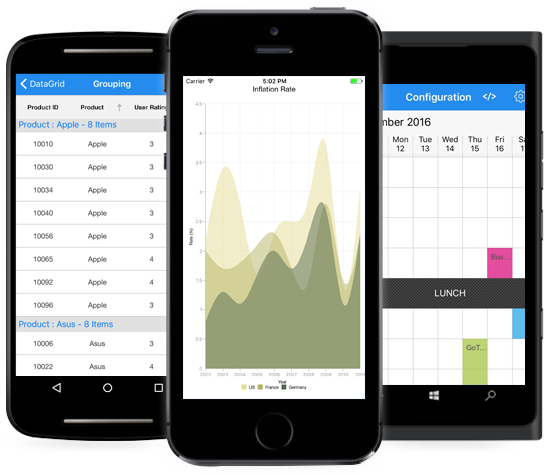 This webinar, featuring James Montemagno, Principal Program Manager for Xamarin at Microsoft, was recorded on July 14, 2016. In “What's New in Xamarin.Forms and Essential Studio for Xamarin,” you’ll learn to build cross-platform native UIs with one shared codebase—something that was once just a dream is now a reality. James will give you a full breakdown of all the spectacular, newly released features, and a peek into the future of Xamarin.Forms. Then he will show you how to extend your Xamarin.Forms projects with Syncfusion's Essential Studio for Xamarin, which has over 50 controls—charts, grids, and much more—to make your apps awesome. Here are some screenshots from our samples. You can also view or install the live demos. Get started by downloading a fully functional, free personal license.